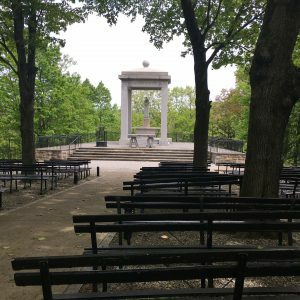 I had the good fortune to carve out some time this morning to visit Graymoor In Garrison, NY. Graymoor has another name the “Holy Mountain” over looking the spectacular Hudson Valley Highlands. And that name is well earned because it is a place of great spiritual consolation for those who make retreats here at the Spiritual Life Center, and for the men who are welcomed at St Christopher’s Inn for counseling and rehab from substance abuse. Miracles of recovery have happened here through the work of the Franciscan Friars and Sisters of the Atonement. I have heard men give testimony about how their lives were saved when they were desperate and came to the Holy Mountain for help. I’ve had the privilege of leading some weekend women’s retreats here, but on this beautiful May day there was no agenda, just the gift of time to wander the gorgeous grounds and slow down the pace of my life for a little while. There are many shrines, altars, gardens and chapels tucked away on winding paths on the acres and acres of wooden grounds. The offerings are so rich that there is even a map available detailing them for visitors. 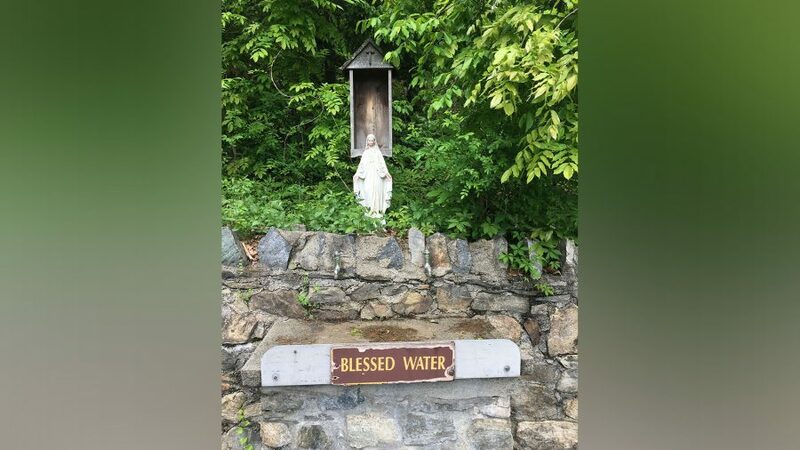 But this day one very humble spot drew me in: a very weathered statue of the Blessed Mother standing over two outdoor faucets with a sign reading BLESSED WATER near the grassy labyrinth. Imagine free flowing spigots of blessed water to fill and fill and fill our empty cups! I love that the statue of Mary was so beat up and time worn. The paint on her face was peeling and the elements have bleached out the blue of her flowing robes. She stands watch over that place of BLESSED WATER reminding us that when we descend the mountain and enter back into our real time lives, divine guides will remain our companion in all the rough and tumble that can weather our own souls. And that something blessed will always fill our empty vessels.